Ongoing Programs for families with of all ages. Fun Sunday activities for children 5 years old and under. Mazel Tots meets at TBE. Mazel Tots is fun activities for children 5 years & under with their families - members & non-members alike. Drop-ins are welcome. Please bring a healthy snack to share. 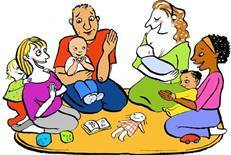 Go to the Mazel Tots page for the schedule of activities. Any questions? Contact Sarah Clarkson. Shabbat programs for families with children of all ages. Meet and schmooze with other Jewish families at a vegetarian family potluck Shabbat singing dinner and fabulous engaging Shabbat activities. The program is free and open to the public. Beth El Bim Bam programs meet at Temple Beth El. Go to the Beth El Bim Bam page for dates and activites. The Young Families Project continues to offer FREE Jewish events for families with children. If you are interested in finding out more about our events, sponsoring, or making a contribution to our events, please contact Sarah Clarkson at sclarkson@tbeaptos.org. Sign up for Free Jewish books delivered to your home for families and children ages 6 months‒8 years old www.pjlibrary.org. Sign up for Free Jewish chapter books delivered to your home for children ages 9‒11 years old www.pjourway.org. For more information about any of the above programs, please email Sarah Clarkson or call her at 831-479-3444 ext. 218.
in TBE in the coffee lounge. Quality social time with parents and babies birth to age 3. Questions? Contact Sarah sclarkson@tbeaptos.org. Join us for a Young Families Project Seder for children and their families. There will be a short service with lots of action and a coloring book Haggadah, appropriate for children of all ages. The temple provides matzah, grape juice and vegetarian matzah ball soup. We would appreciate your RSVP to sclarkson@tbeaptos.org and your help bringing symbolic foods. Also consider bringing a side dish or something your children will eat to share. Young families are invited to make Challah on Thursday, May 16, 3:30 PM, at New Leaf Market, 1101 Fair Ave., Westside Santa Cruz. RSVP to sclarkson@tbeaptos.org.